I’ve moved my site to www.mikesearleart.com, if it wasn’t readily apparent. I hope you’ll continue to follow my work there! Greetings friends and followers, I wanted to let you know that Ardith Goodwin has volunteered to begin the third iteration of The Plus Project! Ardith will be selecting a different member of the Google Plus community every day and writing a poem just for them! Corey Gearhart did an awesome job with the Second iteration of The Plus Project, and I know that Ardith will absolutely continue to do it justice. You can follow her progress at ardithgoodwin.com. Make sure you circle her so you can stay on top of who she selects. Who knows, the next one could be you! When I began The Plus Project the point was to connect with other people and to make them feel good. I wanted to take one person, and make them feel valued and recognized. I wanted to bring joy to someone else’s life and show them that they matter and that they are loved. I know that I have it in me to be heard and to make a difference for someone. And I hoped to be able to make a difference by showing others that they can make a difference. It reminds me of the story of the boy and the starfish. It’s been travelling around the internet for some years, so you may have heard it. I wanted to do that for someone. I wanted build a globe spanning community that is connected by more than just wires and electricity, but by an appreciation for each other and for the value inherent in all human life. I want people to be able to focus on the things that connect them more than the things that separate them. I want people to see that we are – each and every one of us – incredible beings, with the ability to make a difference; with the ability to bring joy into the hearts and lives of others. Since creating The Plus Project I have met a staggering number of fantastic people, and I have been amazed at the number of individuals who have expressed an interest in walking the same path. I’ve had the opportunity to speak words of encouragement to people dealing with the challenges of being gay in a culture that is largely anti-homosexual. I’ve participated in discussions on gender assumptions. And I’ve been able to support people who have fought for, and won, their personal freedom. There have been several people that have contacted me about doing something similar on their own, and I’ve been asked to host some video chats with the individuals that I selected for The Plus Project (currently in the works) to continue the discussion. The point is that people have the desire and the ability to connect, and to do awesome things. Sometimes they just need an idea to rally around and to motivate them. The picture above was created by Corey Gearhart, as part of his Second Iteration of The Plus Project. I’ve been under the weather for the last few days, and he surprised me with it earlier today. To say I was blown away is an understatement, but not just because it’s a great piece of artwork or because it was unexpected. I was blown away because it is an example of the fact that a single person has the ability to make a difference to others, and to the world. Maybe something I said or did was important to Corey, but it doesn’t matter because now he is doing and saying something that is important to others. He is showing people that they matter enough to him for him to set aside time from his day to do something that is just for them. He is giving them a gift of beauty and joy that is not only theirs to keep, but theirs to share. It is my sincerest hope that the people touched by Corey will choose to share their joy with others, and so continue the cycle. Corey is totally awesome! Be sure to check out his work! So, I just concluded the Plus Project yesterday. If you’re interested you can go read that post here, or follow the discussion about it here. I had expected there to be some people that would congratulate me, or offer some nice words, but the outpouring of support that I received went way beyond what I could have expected. Why am I still talking about this? Because it is a great example of the way that sharing our stories and our lives with each other can bring us together. Not in some hokey utopian kind of way, but in a real and authentic human kind of way. I’ve met so many wonderful people through this experience. Certainly the people that I selected for the Plus Project come to mind, but I’ve also met so many incredible people through them. People I never would have spoken to otherwise. Don’t get me wrong, I’m not naive. I know that it’s not like I just magically became BFF’s with everyone all of a sudden, and there are some (maybe even many) of them that I probably will never hear from again. But that’s ok. It’s ok that our connection may have been transient. It’s ok because the point wasn’t to build lifelong friendships (though that would be nice), the point was to make someone smile, even if only briefly. I also wanted to remind the readers that I am still looking for people that would like to begin their own iteration of the Plus Project. I’d love to help you if you’re interested, but it doesn’t have to be a collaboration. You’re welcome to do it on your own. I would encourage you to do whatever you love. Do whatever you’re good at. Whatever sparks passion in your heart, do that thing, and find a way to bring others into it. It doesn’t matter what that thing is, just take a step in the direction of what you love, and invite others on the journey. I’m keeping this short and sweet today, so go hug someone, go laugh with someone, or comfort someone. Go play with someone, or share your story with someone. Go and share your authentic joy with another person, and remember that only you are uniquely qualified to share your joy with the world. Yesterday was a full thirty days since I began the Plus Project! Wow, what a ride it’s been! I’ve met designers, a scientist, a birthing specialist, an author, and even an animal trapper. There were single moms, recent college grads, cyclists, and entrepreneurs. I’ve had the pleasure of making the acquaintance of men and women from all four corners of the map, some whose language I do not even speak, each doing wonderful things with their lives by speaking their opinions, creating with passion, and sharing their stories. Each of them is leaving an indelible mark on this world simply by being here; simply by living. Each of them is making the world a better place just by being themselves. With that being said, I have officially decided to conclude the first iteration of the Plus Project. Yeah, it’s true. I’ve thought long and hard about whether to continue the Plus Project, but I think it would be pretentious for me to attempt to stretch it further in its current form. The ultimate goal of the Plus Project was to recognize people for their extraordinary selves, for the simple poetry of each of their individual lives, and in the process identify the beauty and majesty within each of us. In that regard, the Plus Project has wholly succeeded well beyond what I ever would have imagined. The beauty of the Plus Project is that it is personal. There were no algorithms used in selecting people. There were no hordes of machines on an assembly line. No focus groups, or test markets, or advertising campaign. Just one guy with a silly idea. Just me, trying to make someone else’s day brighter. While I could continue, I would be forcing it, and instead of it continuing to gradually reveal the masterpiece of our humanity, it would become something much more manufactured. It would become something mass produced, machine assembled, and prepackaged for your convenience. However, you may have noticed that I referred to it as the first iteration of the Plus Project. That is because I don’t intend for this to be the complete end of it. I would like to see the Plus Project continue in new forms and shapes, with new ideas and methods. I would like to see you carry the torch in showing the world that people matter, and that one person can have an impact on the mankind. With that in mind, I am looking for people that would like to begin their own iteration of the Plus Project. I am looking for people that would like to partner in creating something that is fresh, and authentic, and from your own heart. It could have a duration of thirty days, or a year, or just a week. It doesn’t matter. You could do what I’ve done and write about people. 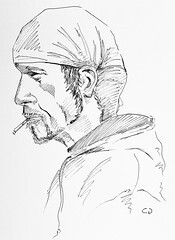 You could sketch someone’s portrait each day, or photograph them at play. Maybe you have a podcast and could interview them. The means and method don’t matter near as much as the underlying goal of unveiling the beauty of humanity to the world, and bringing joy into someone else’s life. If you’re interested, let me know in the comments, or send me a private post, or you can email me from my Google Plus profile. I’m happy to brainstorm with you to come up with ideas, and you’re even welcome to use the logo I made for the Plus project, if you like. So I’m asking you, will you begin your own iteration of the Plus Project? In case you missed any of them, I am including below a list of all of the individuals that I have selected, and links to what I had to say about each of them. Feel free to share my posts on Google Plus, or on my blog as you see fit. To the people that I have already selected, you are creative, fantastic, incredible people, every single one of you, and I have been beyond honored to get to know each of you. You are each individually and uniquely awesome in a way that no one else ever has been or ever will be. What you do is wonderful, what you think is critical, and what you say is crucial. You bring a light and a vibrance to humankind. The passion in your heart is essential. Your impact on the world is irreplaceable, and you are irreplaceable. You matter, and you are loved. I wish the best to each and every one of you. I’ve selected Jenni R for today’s Plus Project. Jenni is a banker, blogger, and web designer living in Hyogo, Japan, and she is the creator of IntenseBlog where she posts often about topics related to blogging, and using your blog for marketing. She has some excellent posts about plagiarism, re-purposing content, and many other topics. Jenni has a good deal of really great shares on StumbleUpon, and she tweets periodically @wpbloggers, largely about blogging. Jenni’s blog contains several helpful tutorials, and her philosophy seems largely built around doing what you love and engaging with the audience, and she actively interacts with and responds to her readers. Jenni is a fan of Lady Gaga, and web design (of course! ), and it’s good to see someone who not only knows their work, but truly loves it. If you like her blog, you can find it’s page on Facebook, where she goes even more in depth about how she blogs, design criteria, and tricks of the trade. You can connect with Jenni on LinkedIn, where she is interested in consulting opportunities. Jenni is a beautiful woman with a tender heart, and it is clear that she has an authentic love for what she does, as well as for her audience. If you need help getting your blog off the ground, or are an established blogger looking to extend your network, Jenni will be a great addition to your circles!